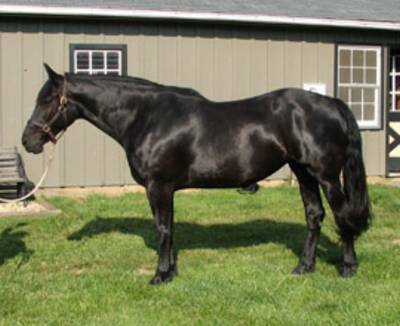 Molly is a 1999, 16.3H, brown RID mare bred at Oak Hill Farm. Though she inherits her mother's color, which reflects back to the famous mare Toames Beauty, she has the body, build and athleticism of a typical Flagmount King. She had a severe bout with colic that required surgery when she was six weeks old. Her chances of survival were less than 10 percent, but thanks to the great doctors at the Marion DuPont Scott Equine Center in Leesburg, Virginia, she is thriving today and earning her name. Since then, Molly has been referred to as ‘the mother ship’ because loves people and thinks she deserves everyone’s attention. Molly both rides and drives. She is by the grade A international show jumper Flagmount King, out of our own Graceland Pride. Flagmount King was one of the few RID stallion who was competed as a speed horse in the jumping ring. This same pedigree combination (Flagmount King ex King Elvis/Annaghdown Star mare line) is found with the RID stallion Flag of Diamonds.